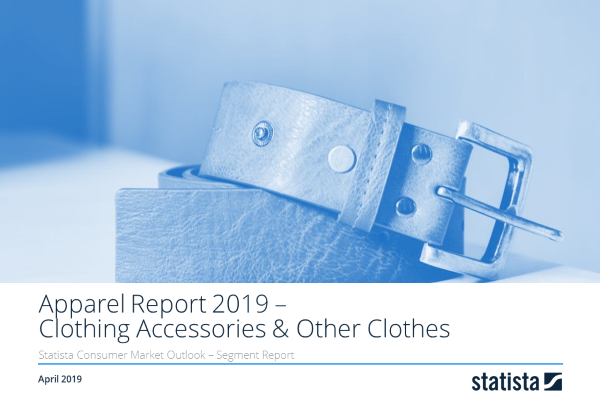 Revenue in the Baby Clothes segment amounts to US$11,048m in 2019. The market is expected to grow annually by 3.1% (CAGR 2019-2023). In global comparison, most revenue is generated in United States (US$8,405m in 2019). In relation to total population figures, per person revenues of US$14.61 are generated in 2019. The market for Baby Clothes encompasses the entirety of clothing articles and accessories for children up to a height of 85 cm. Clothes for taller children are subsumed into the other clothing segments. Since Baby Clothes are neither differentiated by product group nor recorded by number of units in the external trade statistics, the quantities displayed here are indicated in units of 100 gram in contrast to the rest of the segments. Reading Support Revenue in the Baby Clothes segment amounts to US$11,048m in 2019. Reading Support The Baby Clothes segment is expected to show a revenue growth of 3.8% in 2020. Reading Support The average revenue per person in the market for Baby Clothes amounts to US$14.61 in 2019. Reading Support In the market for Baby Clothes, volume is expected to amount to 1,633.92 m pcs. by 2023. Reading Support The market for Baby Clothes is expected to show a volume growth of -0.7% in 2020. Reading Support The average volume per person in the market for Baby Clothes amounts to 2.23 pieces in 2019. Reading Support The average price per unit in the market for Baby Clothes amounts to US$6.55 in 2019. Reading Support With a market volume of US$8,405m in 2019, most revenue is generated in United States. Here you can find more studies and statistics about "Baby Clothes".